Our ABCs of Development series continues today with the letter P, for posture. Learn more about why good posture is important and why so many kids struggle with it! The ABCs of Development series has been so popular here at The Inspired Treehouse that we really want to make each and every letter pack a huge child development punch for our readers. Today we decided to be a bit broad and talk about posture. As a mama of a swimmer and three very tall children, I am constantly nagging my kiddos to pull their shoulders back, stand tall, and sit straight. Why? Part of the reason is that I was raised with my mom harping on me to be proud of my height and not try to hide it by slumping. Another reason is that poor posture can lead to a whole boatload of other problems, including back pain. 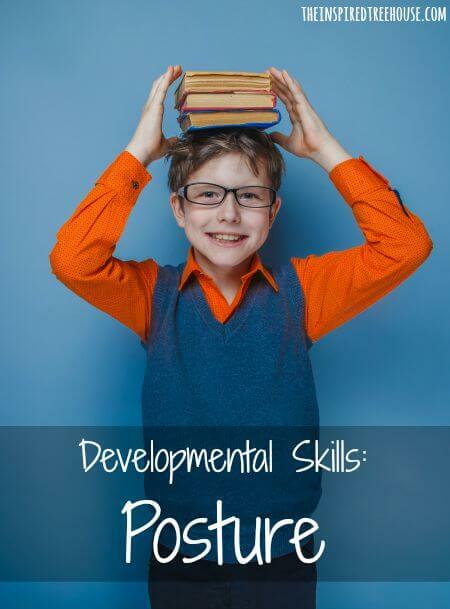 So why do kids today struggle so much with initiating and maintaining good posture? -First off, they spend a lot of time in front of televisions and video games and, if you observe one of them as they are mesmerized by their electronic devices, most likely you will not see a child sitting up tall with her knees/hips/ankles all at 90 degrees. Right? -Kids also spend a ton of time sitting in desks as the school curriculum becomes more demanding and allows less and less time for movement breaks like recess and PE class. -Because of this, they are not exposed to the amount of free play they need to learn to move their bodies in all directions and to improve trunk strength and core stability. -Kids today also carry backpacks that are holding books and materials that can sometimes exceed 30% of their body weight. How do they compensate for that? By hunching and slumping their bodies forward. What can you do to help improve your child’s posture? -Be a good role model! Work on sitting up straight at the dinner table or on those bleachers while watching their sporting events. I know – easier said than done. But, your kids are always watching you! And, when they see you sitting up straight, they’ll follow your lead. -Have the child sit on a stability ball to complete school work. The ball should be just big enough that they can sit comfortably on it with their hips, knees and ankles all at 90 degrees. The ball requires those postural muscles to work hard as the child tries to stay on! Sitting on a ball also offers some great sensory benefits — double bonus!! -Encourage frequent stretch breaks and movement breaks! I am not naive enough to think that a child will never sit for long periods of time in front of the TV or in class. BUT, you can encourage them to stand up, reach their arms overhead and lean back to stretch those over flexed posture muscles during every commercial break or during a pause (gasp!) in the video game! -Check out this article on why posture is so important for school!